This list isn&apos;t exhaustive though it comprises the most important tools in our stack. Each library solves a particular problem with frontend development; we&apos;ll walk through each of them in the coming chapter. Starting at the bottom right we have components that can trigger actions. The action passes through middleware. Middleware handle action-specific tasks like listening to promise statuses. Middleware can also trigger new actions. Reducers receive the action and any associated data. Reducers can choose to change global state within the store by returning new state. Components receive the state they need as props, and render HTML to the DOM. It&apos;s important to understand this flow, and it&apos;s even more important to know why we stick to it. This architecture has several benefits over classical frameworks such as Ember or Angular. 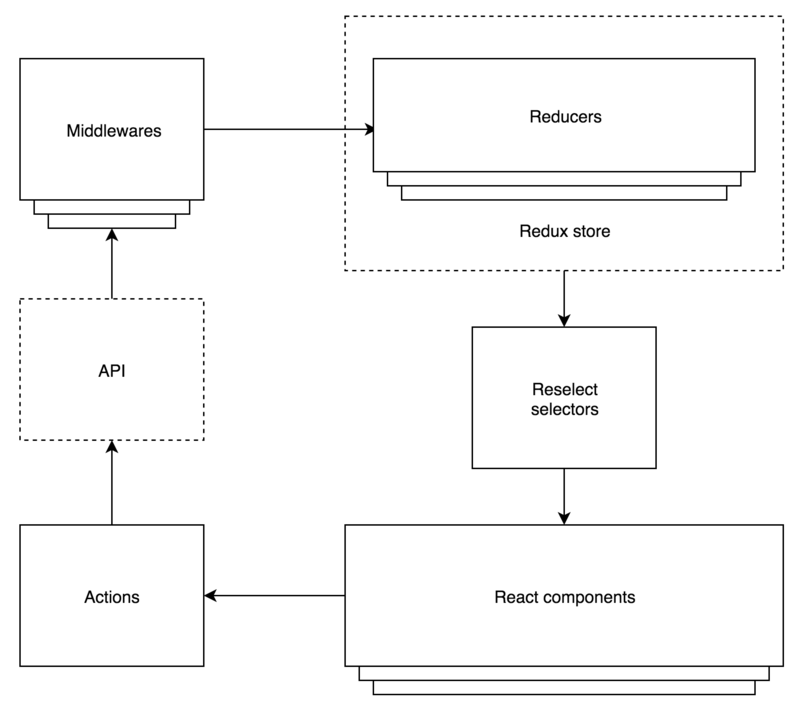 We&apos;ve added reselect as an intermediary between the redux store and components; classically components get state directly from the store. Reselect queries and transforms data for each component. This means that each component is entirely reusable because they only display data they&apos;re given. We talk about this more in the &apos;transforming state per component&apos; chapter. Fetching and normalizing data from each component using actions works, though it isn&apos;t declarative. Ideally components would declare data they need without worrying about fetching data. We&apos;d then have some background logic that takes care of API requests, caching, and data transformation on the component&apos;s behalf. This is the idea behind Falcor and Relay. These mean that each component can be completely declarative, making things even easier to build and understand.